Talented Palmetto State wideout traveled to Blacksburg to commit to the Hokies. 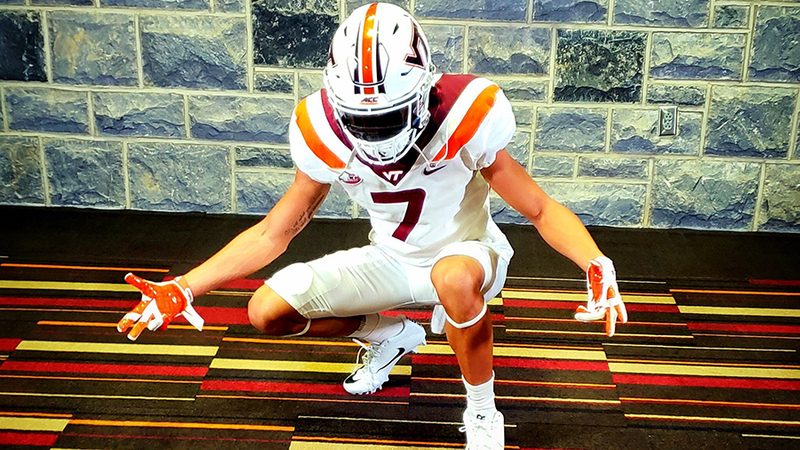 Two weeks ago Jalin Hyatt visited Virginia Tech for an elite junior day event. On Saturday he made the trip from South Carolina again, this time to commit to the Hokies. The 6-2, 165 pound Dutch Fork HS (Irmo, SC) product hauled in 71 passes for 1,316 yards, and 21 touchdowns for the three-peat Class 5A champions last season. That includes this gem of a grab. The 247Sports Composite ranks Hyatt as a 3-star (0.8628) wide receiver. However, he reportedly holds offers from Tennessee, Michigan, and Penn State. Moreover, Justin Fuente prioritized Hyatt in the Hokies' 2020 class and secured his verbal in short order. Kid is a G. I'd be surprised if he didn't end up a 4*, but even if he doesn't we are getting a player who can make big plays in college regardless. I had the opportunity to see him play last year. He has real football speed from my vantage point. He also has a great frame and will develop physically. Tape has a lot of similarities with Tre Turner. Wow! I just hope we can hold back the "Big Dogs" to retain his committment! Looks like Jafar Williams is listed as one of his recruiters on 247. Not a bad start at all! Welcome to Hokie Nation Jalin! Looking forward to a stable of big-time WR's for years to come in Blacksburg! Like seeing the yards after catch. He definitely has speed and power to get past some of those appointments, but they may not of been very good either. We have to remember he's still just a junior so there's a whole year of others expressing interest in him. "I'm going to be the best recruiter y'all have." "Def not the worst. Sigh." Liechtenstein has handled a lot of that for Nix. We do not quit!! Again! Again! Huge pickup. Like others have said, he will be a solid 4* correctly ranked. He and Lambert are 1A and 1B at the position. Like the fact that his highlight film included some awesome downfield blocks as well. Guy gets that it's not ALL about the catches!